China’s expanding and modernizing military power could change everything in Asia. The Chinese People’s Liberation Army will be getting rid of 300,000 soldiers from its ranks in a bid to and make its army leaner and more professional. Chinese President Xi Jinping announced these cuts in a public address after a military parade marking the 70th anniversary of the country’s victory over Japan in World War II earlier this month. But even with these cuts the Chinese military will remain the largest in the world. While the army might be getting downsized, China’s ambitions in the region are clearly expanding. The Chinese military parade – its greatest so far – was aimed at delivering multiple messages. For the domestic Chinese populace, the Chinese Communist Party underlined its centrality not only in the nation’s past when the Japanese invaders were tackled effectively but, more importantly, now when China seems to be moving closer to achieving the status of a great power. For the international audience, and in particular for the region, the message of the Chinese leadership was also clear: Chinese ambitions are expanding and it now has the wherewithal to protect and enhance those interests in and around the larger Indo- Pacific. 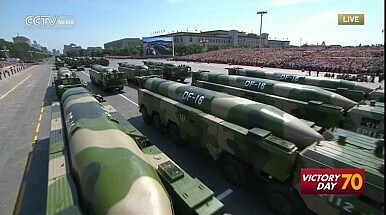 One important aspect of the parade was the first public appearance of the Dongfeng 21D “carrier-killer” ballistic missile. The U.S. military is increasingly concerned about the DF-21D, as its speed makes it difficult for vessels to defend against. The DF-26 with a range of over 5,000km, allowing it to reach anywhere in the South China Sea as well as the U.S. naval base in Guam, was also on display. Though there remain many unanswered questions about the future trajectory of the new Chinese reform program what remains certain is that a fundamental transformation of the Chinese military is underway with significant implications for the region at large. This will predictably cause consternation in the region and beyond. Already regional powers are responding to the rise of China in several ways. Japan is reconfiguring its defense forces so as to enable it to respond rapidly to national threats with a special focus on the defense of southwestern islands facing China. The Abe administration has not only increased the nation’s defense budget but has now succeeded to push through bills that will allow the Japanese Self-Defense Force could come to the assistance of allies and friends in conflicts. U.S.-Japan defense cooperation is gathering momentum but Tokyo has also stepped up cooperation with other regional states entangled in maritime disputes with China, helping Vietnam and the Philippines to acquire patrol vessels and professionalize their coast guards. China’s growing territorial aggressiveness and its rapid military build-up has rattled some countries in the region, pushing them towards greater military cooperation with the United States. The U.S. has reached an agreement with Malaysia to let American P-8 Poseidon and P-3 Orion spy planes use airbases in the country to spy on China’s activities in the waters off Malaysia’s coast. The Philippines has also welcomed a U.S. plan to deploy air and naval assets to the country as part of the next phase of Washington’s rebalance to the region. U.S. troops are likely to have access to at least eight Philippine military bases under the Enhanced Defense Cooperation Agreement (EDCA) signed last year between the two states. In a sign of warming U.S. ties with Hanoi, Washington has partially lifted a 40-year ban on providing lethal military support to Vietnam in order to enhance its maritime security. The arms embargo was a major stumbling block on the American side of the road to closer U.S.-Vietnam relations. In a significant change in the communist regime’s attitude toward Washington, Hanoi has decided to allow the U.S. Peace Corps to operate in Vietnam. Australia-U.S. defense cooperation has also intensified as Washington has elevated Australia in its defense priorities. This is leading to greater American use of, and investment in, Australian defense bases and training and logistics facilities. In 2014, Australia and the U.S. signed a new Force Posture Agreement that will see 2500 Marines and dozens of U.S. warplanes and warships exercising and replenishing at Australian ranges and bases. Australia plans to boost its military spending to 2 percent of GDP in a decade, a substantial part of which will go to a stronger blue water presence for Australia’s navy, including 12 new submarines, nine frigates and up to 20 offshore patrol vessels. India too has been recalibrating its regional ties at this time of great strategic flux. China’s display of its military is prodding New Delhi to invigorate its defense policy and diplomacy to tackle the rising dragon in its vicinity. India hosted its first-ever bilateral naval exercise with Australia this month and JIMEX maritime exercise with Japan in November. India has also invited Japan to join its Malabar exercise with the US in the Bay of Bengal after eight long years. Although Australia and India have participated in military events and exercises together before as well, this will be the first time that the two nations will be jointly planning and participating in a military drill of this nature. As China challenges the established order in the Indo-Pacific with its spectacular rise, other nations are busy trying to preserve the status quo which has served them well. China will have to a bit careful as in announcing its arrival on the world stage, it might just end up spawning equations which might prevent its ascension to the top order.